Lighting of trees, shrubs, and pathways. Installation of rope lighting bulbs in interior spaces. 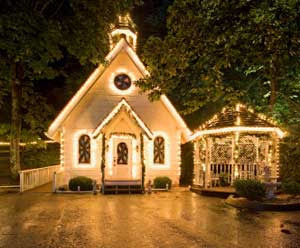 Lighting of roof lines, windows, doors, and installation of garlands. Of course, we can always install any type of rope-type lighting that a wedding party might provide, or we can source the material at the direction of a wedding planner. If you feel that lighting could add something to the atmosphere of your wedding, please call us at 423-648-4408 or schedule a free wedding lighting estimate on our website. We hope your special day is special indeed.